Immigration Museum in Melbourne, Australia has been dynamically engaging with formal and informal education and community activities to enhance cultural diversity in society through artistic installations and interactive visual programs as well as historical exhibitions of migration. A similar concern has been developing in Japan where many actors such as Immigration Museum Tokyo Pilot Program have organized artistic projects. This symposium aims to advance dialogue between Japan and Australia to collaboratively promote cultural diversity in society. * This program is organized by Monash Asia Institute, Monash University and Graduate School of Global Arts, Tokyo University of the Arts. * This program is supported by Australia-Japan Foundation Agency for Cultural Affairs, Government of Japan. 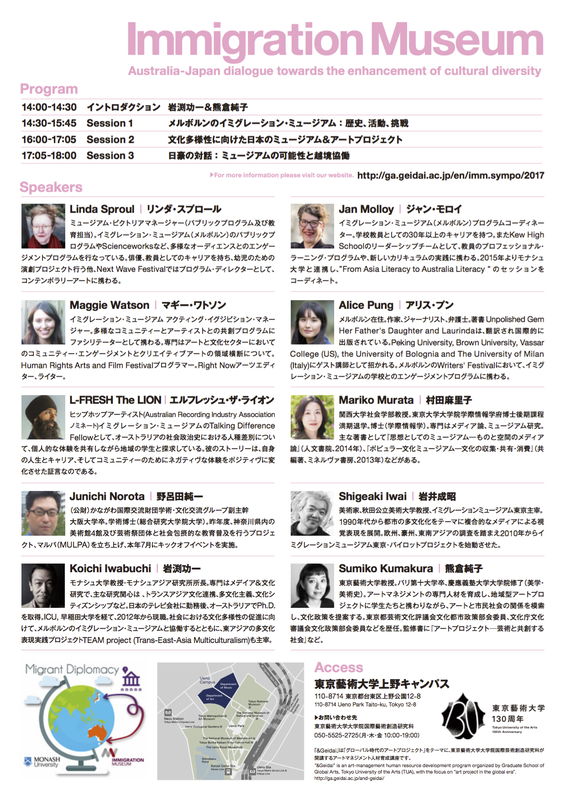 organized by Graduate School of Global Arts, Tokyo University of the Arts. Linda SPROUL is Manager, Public Programs and Education, Museums Victoria. Her professional practice is focused on the engagement and participation of diverse audiences. Her career within arts and culture spans being an actor/teacher in the Early Childhood Drama Project, Program Director of Next Wave – a festival focused on youth audiences and early career artists – and having a contemporary arts practice in the areas of site-specific installation and performance. In her current role at Museums Victoria – Australia’s largest public museum organization – SPROUL manages the public programs offered at the Immigration Museum, Melbourne Museum and Scienceworks at the museums Victoria as well as Museums Victoria’s outreach programs. Jan MOLLOY is an experienced classroom teacher; with over 30 years practice in Victorian Government Secondary Schools. From 1996-2006, as a member of Kew High School’s leadership team, MOLLOY managed staff professional learning and the implementation of completely revised curriculum. For the last 11 years, she has coordinated Education Programs at the Immigration Museum. She has held leadership positions with the History Teachers’ Association of Victoria and the History Teachers’ Association of Australia. She is involved in a range of partnership projects with tertiary educators, preservice and inservice teacher training, and since 2015, has been working with the Monash Asia Institute to coordinate “From Asia Literacy to Australia Literacy” sessions at the Immigration Museum. Maggie WATSON is the Acting Exhibitions Manager at the Immigration Museum. She facilitates the co-creation of exhibitions with diverse community groups and cultural practitioners. She has a particular interest in community engagement and inclusivity within the arts and cultural sector, and also in the intersection of creative arts with museum practice for developing enriching visitor experiences. WATSON is also the Arts Programmer for the Human Rights Arts and Film Festival, and Arts Editor and Writer for Right Now, an online human rights media organization. Alice PUNG is a Melbourne writer, journalist, lawyer and teacher. Her award-winning books include Unpolished Gem (Black Inc., 2017), Her Father’s Daughter and Laurinda (Black Inc., 2011), and have been translated and published internationally. PUNG has also been a guest lecturer at Peking University (US), Brown University (US), Vassar College (US), the University of Bolognia (Italy) and The University of Milan (Italy). Every year, she is involved with the Immigration Museum in its schools engagement programs as part of the Melbourne Writers’ Festival. L-FRESH The LION is an ARIA nominated Hip Hop artist and creator hailing from Western Sydney. He is an artist of rare integrity and relevance, whose music strives to break down cultural barriers and make our society a better place as much as it does to illuminate and entertain. Prowling the Australian scene, he has quickly become renowned for his powerful presence, inspiring live shows and thought-provoking lyricism. His organic amalgam of world-class music and social activism has seen him seamlessly segue from underground events and ciphers to national tours and major festivals, the natural ascent of an MC with an abundance of purpose and self-belief. YouTube have recognised L-FRESH’s work as a social change maker by selecting him as Australia’s only fellow for their Creators For Change program, which promotes and supports 28 creators from around the world. As Talking Difference Fellow of Immigration Museum, L-FRESH shares with local students the nature of racism in Australia through an exploration of socio-political history and by sharing his family’s own personal experiences. His story is a testament to turning negative experiences into positives for his life, career and the communities that he is part of. Mariko MURATA is a Professor in the Department of Sociology, Kansai University. She received her PhD from the Graduate School of Interdisciplinary Information Studies, the University of Tokyo. She specializes in Media and Cultural Studies, and Museum Studies. Her recent publications include Museums as Ideology: Media Studies on Objects and Spaces (Jimbun Shoin, 2014) and Popular Culture Museums: Collecting, Sharing and Consuming Culture (Minerva Shobo, 2013). Junichi NOROTA is Assistant Director at the Academic/Cultural Exchange Group, Kanagawa International Foundation. Born in1972, he earned a Bachelor of Economics from Osaka University and a Ph.D. from the Graduate University for Advanced Studies. Last fiscal year 2016, he started up a newly project Museum Unlearning Project for All (MULPA), which aims for social inclusive education at museums with 4 art museums in Kanagawa Prefecture and a civil group connected by some art projects, and hosted the kick-off event with them in July 2017. Shigeaki IWAI is an Artist/Professor at the Akita University of Art/Director of the Pilot Project for the Immigration Museum Tokyo. He has continued producing a variety of visual expressions that are composites of video, sound, texts and curation based on his research of specific communities in Japan, as well as in Europe, Australia and South East Asia, which he began conducting in 1990. In recent years, alongside these activities, he has been hosting workshops for all generations and conducting research on multiculturalism. He is also a lecturer at the Department of Musical Creativity and the Environment, Faculty of Music, Tokyo University of the Arts. Koichi IWABUCHI is Professor of Media and Cultural Studies and Director of Monash Asia Institute, Monash University in Melbourne. His main interests are media and cultural globalization, trans-Asian cultural flows and connections, and multicultural questions and cultural citizenship in the Japanese and East Asian contexts. After working for a TV company in Tokyo, IWABUCHI received a Ph.D. in Australia. He had taught at ICU and Waseda University until he moved back to Melbourne in 2012. 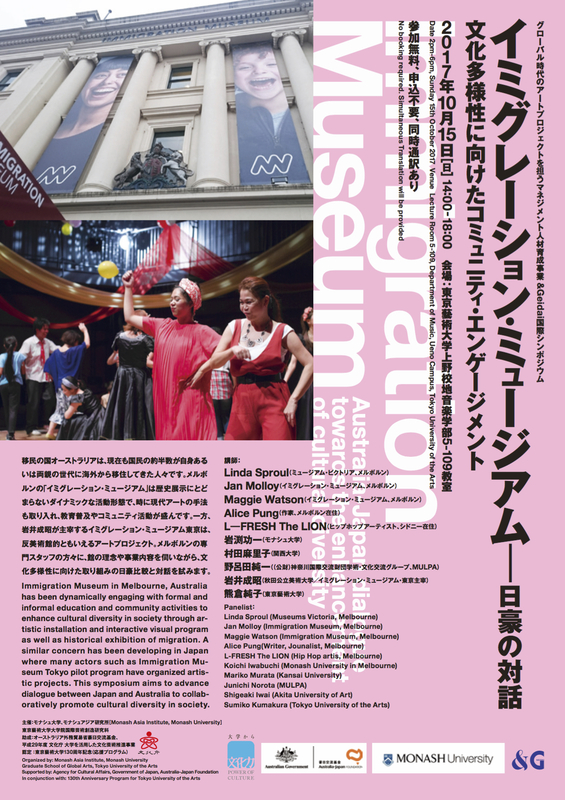 IWABUCHI has been actively collaborating with Immigration Museum in Melbourne to further enhance cultural diversity. He also leads TEAM project (Trans-East-Asia Multiculturalism), which promotes transnational exchange and collaboration among film makers, performers, NGOs, NPOs and researchers to promote visual representation of cultural diversity in East Asia. Dean of the Graduate School of Global Arts, Tokyo University of the Arts; Professor in Art Management and Cultural Policy Studies. She gained her BA from Université de Paris X and the MA from Keio University (Art History and Aesthetics). She is a producer of numerous regional art projects such as the Toride Art Project, Kitamoto Vitamin and Art Access Adachi: Downtown Senju––Connecting through Sound Art. She is also an adviser on cultural policy for Agency for Cultural Affairs, Government of Japan and the Tokyo Metropolitan Government.